Salt Water Taffy is something that I always identify with summer and the beach. My dad’s family lives around the Philadelphia area so we would go to Ocean City, New Jersey for a week in the summer. The boardwalk has stores selling salt water taffy about every ten feet. The boardwalks in New Jersey were built because the storeowners did not want the tourists to track the sand in from the beach. The stores were elevated to create a walkway that would allow the sand to pass through the boards to the ground underneath. 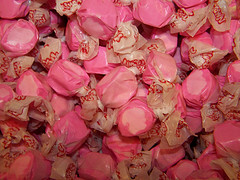 In 1883 one storeowner had his door open when a tidal wave sent salt water into his store and all over his taffy candy. While he was cleaning up a young girl and her mother came in the store. The girl asked for some taffy and he responded that she could have his salt water taffy, thinking it was ruined and that the girl would just leave him to continue cleaning up. The mother, not realizing he was being sarcastic, bought some candy for her daughter. On the way out of the store, the girl told her mother that she loved the taffy. Whether that is how it actually happened is up to the imagination. By the 1890s Salt Water Taffy was being sold all along the boardwalk. (c) 2012 Michele Tracey, reprinted by permission.